Robert Bishop is a professional woodturner from the High Wycombe area specialising in hollow forms whose favourite woods are monkey puzzle, yew and burrs of any type. He looks for interesting features in the wood which at one time would have been called defects by furniture makers. He prefers to call it “character” and can be burr, bark inclusions, branches and spalting. He wondered if we knew the origin of the word “spalt”. As nobody seemed to he explained that when furniture makers of old found such fungal pattern they considered the wood “spoilt”. It’s a good story anyway. 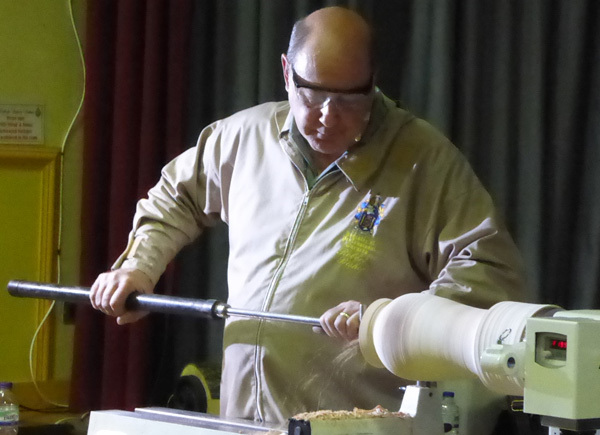 Robert’s usual method is to rough turn wet wood outside then hollow the inside to a uniform wall thickness of about 15 mm then to allow it to dry slowly before re-mounting on the lathe to finish turning. He will have turned a tennon (spigot) at the base for re-mounting. The drying process has to be slowed down or the wood will split. Robert uses multi-layer paper sacks (from Ecosack ), turning the sack inside out every so often to allow the wet inside layer to dry. This can take months so you need a lot of space to store the work in progress. The wood will distort during drying so the wall thickness has to be large enough to allow re-turning but small enough to allow it to dry without splitting. 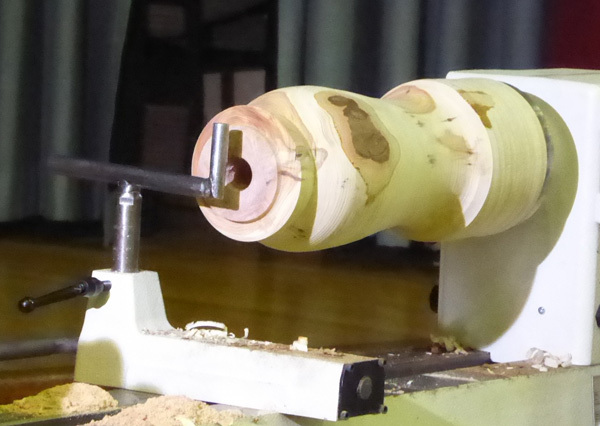 Clearly this process is too long for a one night demo so he just showed the rough turning process using a log of wet yew which he had already mounted on a faceplate. 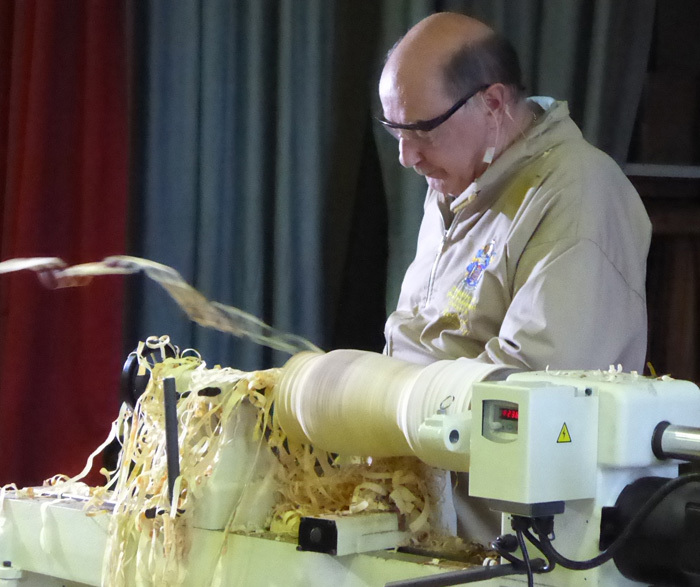 Those in the front row will have shared the buzz you get as the shavings come streaming off when turning wet wood with grain parallel to the axis. Best not to think about having to clear up the mess later. For this initial shaping of the outside, Robert used a roughing gouge and a bowl gouge with a long grind. Hollowing fills the cavity with shavings that need to be cleared out regularly. Robert had adapted a large plastic spoon with the sides cut off for this purpose. 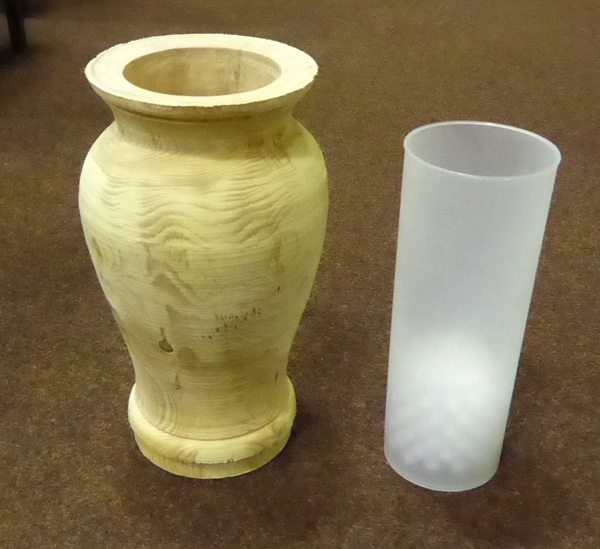 Having been asked so often whether wooden vases can be filled with water for flowers, Robert came up with a neat answer. He uses an optional waterproof insert made from a plastic loo brush container. There was just time for a look at the members’ gallery. Robert was brave enough to offer some criticism and advice about shapes and finishing. I hope people were not upset by this. I thought it was helpful. The gallery items can be seen on the website.